Carla Bruni and Arno Klarsfeld at a 1995 Gianni Versace show. First Lady of France Carla Bruni-Sarkozy was raised as the daughter of Italian concert pianist Marisa Borini and industrialist and classical composer Alberto Bruni-Tedeschi. However, in a 2008 interview published in Vanity Fair magazine, Bruni-Sarkozy revealed a bombshell: Her biological father is not really Bruni-Tedeschi. Carla found out about her illegitimate birth in 1996, at age 28, when her legal father, Bruni-Tedeschi, was gravely ill. He summoned Carla to his deathbed and spilled the long-kept secret: Genetically, he revealed, Carla was not his daughter. Rather, he went on, she is the love child born of an affair his wife conducted for six years with a man half her age. Carla’s biological father is the Italian-born, Brazilian grocery magnate Maurizio Remmert, who, as a young classical guitarist, met Marisa Borini when the two played in a quintet together. How did Carla react to the news? 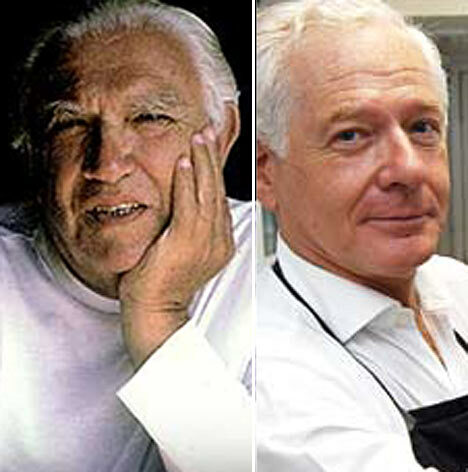 Carla Bruni's 2 millionnaire dads: Alberto Bruni Tedeschi (left) said on his deathbed that Maurizio Remmert (right) is Carla's real dad. In 2008, Carla’s biological dad Remmert broke his 40-year silence on the matter and confirmed that he is Carla’s real dad. Remmert lives in São Paulo, where he is a grocery magnate, and Carla is in frequent contact with him. Since learning the painful truth, Carla has been through years of therapy. oh, i think i have to browse through the archives – all those wonderful posts… thank you for this blog, again!